Roberta G. (Bobbie) Stempfley joined the Carnegie Mellon University Software Engineering Institute as director of the SEI's CERT Division in June 2017. 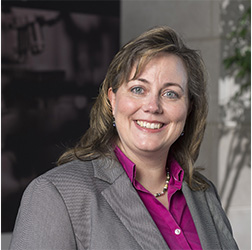 Stempfley previously served as director of cyber strategy implementation at MITRE Corp. and as acting assistant secretary and deputy assistant secretary, Office of Cyber Security and Communications, Department of Homeland Security. In addition to her work at DHS, Stempfley previously worked in the DoD as CIO of the Defense Information Systems Agency and as chief of the DoD Computer Emergency Response Team, which she established. Stempfley received her bachelor's degree in engineering mathematics from the University of Arizona and her master's degree in computer science from James Madison University. A recipient of many awards, she was recognized by CyberScoop as among the Top Women in Cybersecurity, by Federal Computer Week in the Fed 100, and by Information Week as one of the Top 50 Government CIOs.